Safety goggles! Nitrogen oxides escape to a significant extent, work under an exhaust hood or outdoors! It is difficult to control the reaction, spraying of boiling concentrated nitric acid is to be expected! One adds to a test tube about 1 ml concentrated nitric acid and then adds one drop of about 200μL cyclohexanone. One now with the burner carefully heats until the reaction starts up, this being recognized by the development of brown nitrogen oxide vapors, and then quickly removes the burner. One now slowly adds drop by drop the rest of the cyclohexanone, so that the reaction just barely continues (caution, the reaction begins intensely again and again!). If necessary one heats briefly with the burner. After the cyclohexanone has been completely added, one heats to a gentle boil for about another minute. One lets the reaction mixture cool, colorless adipic acid crystallizes. 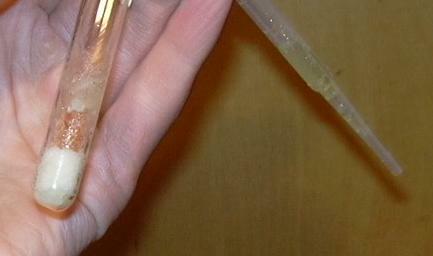 If an isolation of the adipic acid is desired, one syphons off the nitric acid with a pasteurpipette, whereby one presses the tip onto the bottom of the test tube, so that the crystal mass is not sucked in (if necessary one can empty the pipette and repeat). To cleanse the adipic acid one now adds approx. 0.25 ml water (not more, high solubility! ), let this interact for a couple of seconds and then syphon off as above. In order to get a dry product, one can now evacuate the test tube with a water suction pump and carefully heat (danger of implosion! Perform only with a thick-walled test tube.). after , p.350, "Adipic Acid from Cyclohexanone"